How to Generate Ideas to Solve a Problem | SeibCo, LLC. Many team leaders are not trained on how to conduct brainstorming sessions. As a result, many innovative, cost-saving and time-saving solutions are lost. Generating ideas to solve a problem requires brainstorming, which is a structured process where ideas are heard and valued by the team. Yet, many team leaders are afraid of brainstorming and are not trained on how to do it well. Usually, they are afraid they will hear something they don’t want to hear. Or, they will be required to take actions they don’t want to take. Or, they believe the process is too time-consuming. The truth is, true brainstorming saves time and money while engaging and building the team to produce intended results. The biggest mistake is to ask too many people for solutions when you’re stuck. The reason is, most people are not knowledgeable or committed to provide viable solutions for specific situations. Recently, I read a post on FB and the business owner wanted recommendations for a business book. Her business had stopped growing and she wanted to know why. While books do provide insights, they can’t resolve specific individual issues as well as a coach can. When I suggested she talk with a coach, she responded saying she had already talked with over a dozen people and was still stuck! Your best results will occur when you talk with a business coach (focus on one) because that requires being coachable and more committed to resolving the problem than hanging onto it. Energize Meetings. Have ALL team members trained in using meeting skills. This simple first step will energize your meetings and encourage generating new ideas. As part of the training process, use an actual issue in the company. Using real-life situations show how brainstorming is the critical foundation for creating solutions. It also teaches your team the value of generating ideas with others. Develop Persuasive Listening Skills. Many times you and your team will just stop listening when stuck. As a result, new ideas are overlooked or dismissed (because no one was listening!). Develop listening, conflict resolution and building alignment skills. These abilities are important when generating new ideas and creating viable solutions. Handle Difficult Team Members. When team members believe they have all the answers, they will sabotage the efforts of others. It’s important you address the issue immediately, 1:1. 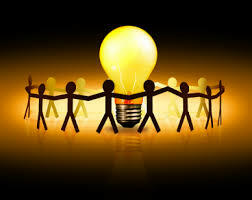 Remind the person no criticism is allowed and wild ideas are welcomed to facilitate a positive brainstorming process. Manage Swoopers. Many bosses today like to think of themselves as helicopters flying at 30,000 feet. They love to swoop in on brainstorming sessions. However, they are rarely focused or prepared. Even worse, when they share their opinions, teams feel demoralized feeling all their brainstorming efforts and new ideas have been thwarted. Talk with your boss privately before they swoop in on your brainstorming sessions. Generating new ideas to solve problems through brainstorming, engages you and your team members to create better solutions. For the past 26 years, Jeannette Seibly has been recognized as a catalyst and leadership expert. She has helped 100s of millennial bosses create more fun, money, and success when working through confusing situations. To develop your brainstorming skills to solve problems, contact Jeannette for straight talk with dynamic results.